“Looks” is a collection of bespoke watch faces pre-installed on the new LG Watch Style and LG Watch Sport. Each watch face had to complement the aesthetics of the hardware and showcase the newest Android Wear 2.0 features. The final collection of 9 watch faces appealed to a range of tastes and everyday needs. Whether at home, the Arctic, the office, on a run, or in a cafe, “Moods” has a watch face to keep you connected to your world – here, there, or anywhere. “Moods” was developed as a “sibling” collection which took advantage of the latest Android Wear features but supported the majority of devices, not just LG Watch Style and LG Watch Sport. A first of its kind, the entire Face Maker experience happens on the watch. Users start with one of two base designs: Classic or Trio and can personalize colors, hands, numerals, and more, simply by swiping and tapping. Alongside development of Face Maker, we purpose-built a way to test each of the 2,800 possible design combinations. The output of this method could be easily checked for possible defects and design improvements. Chronographs are hard: they require a bunch of buttons, give you lots of hard-to-read information, and need to look good on your wrist. We wanted to make the best chronograph watch face by making it simple, beautiful and usable with a single touch. In 2015 we set out to create our most ambitious watch face ever. Our creation, Bits Watch Face, displays the absolute most information possible while ensuring readability and elegance. We custom-built 10 complications and gave users a fun way to lay them out in whatever way they’d like. Tap on a complication and it expands to show additional information. For the “Smart” collection of watch faces, we invented exciting ways to combine calendar, fitness and weather data directly into the watch face itself. These industry-firsts paved the way for future innovation on the platform. Our second attempt at wearable design, The “Basic” collection consisted of 14 brand new watch faces with a bold and energetic look which paid homage to traditional timepieces while remaining authentic to the digital platform. In early 2014, Google asked us to design and build a collection of digital watch faces for their first public release of Android Wear. No one had ever done this before. We delivered a bold and diverse collection of 9 watch faces which subsequently showcased at Google’s I/O developer conference. 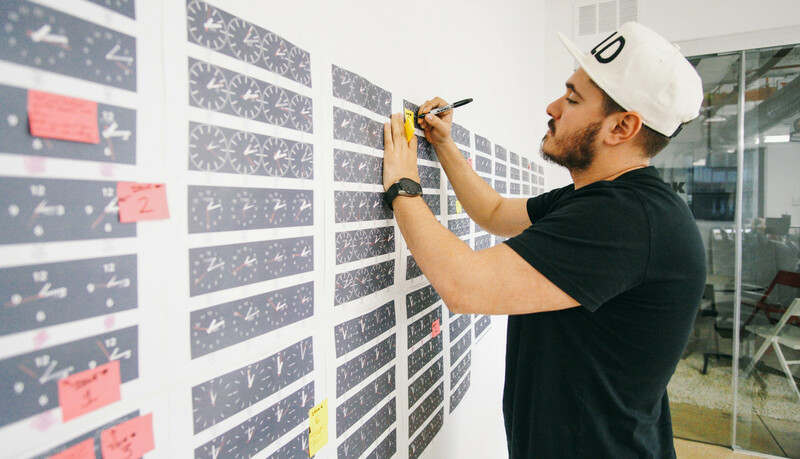 Our process set a new benchmark for watch face design and led ustwo to define the official design guidelines for the platform.